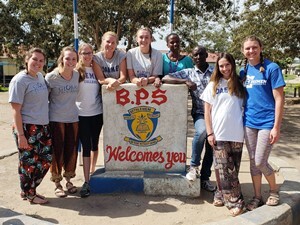 (L-R) Elizabeth Renner, Erin Fransen, Micayla Monks, Professor Justine Tutuska, Adrianna Pencek, Uganda residents Mutoni Docus and Kitamirike Herman Joseph, Jessica Leone, and Jordan Hardie. Over winter break, the Daemen group collaborated on two health-related projects at the Bethlehem Parent School (BPS) and Orphanage, located in Kyotera. Despite facing a number of challenges, BPS provides several valuable initiatives in the Ugandan community, including a high quality education to more than 400 primary school students every year and raising and supporting many orphaned children. The Daemen group of six undergraduate and graduate students who took part in the two-week Uganda experience represented various health sciences majors. Participants included Erin Fransen of Ashville, physician assistant studies major; Jordan Hardie of Attica, physical therapy major; Jessica Leone of Buffalo, master of public health major; Micayla Monks of Horseheads, physical therapy major; Adrianna Pencek of Dunkirk, biochemistry major; and Elizabeth Renner of Cheektowaga, master of public health major. For Renner (pictured at right), the Uganda experience marked her fourth international service learning and study abroad experience during her undergraduate and graduate studies at Daemen, having previously traveled to Italy, Poland, and the Dominican Republic. Renner, who plans to pursue a career in environmental health after graduating with her MPH degree in May, and other graduate students collaborated with BPS teachers on a handwashing and general hygiene project with the goal of reducing widely transmitted diarrhea-based illnesses. Daemen students created “tippy tap” handwashing stations, a hands-free system operated by a foot lever set up in areas where no running water is available. Students instructed BPS youngsters on the importance of handwashing and proper handwashing techniques, maintaining the tippy tap stations, and overall good hygiene behaviors. The undergraduate student project focused on feminine health that included a workshop on menstrual health, challenges surrounding women’s health in Uganda, and empowering young women against abuse and violence. Daemen students supplied the BPS young women with cloth menstrual pad kits, which were created by college and community volunteers in the months leading up to the Uganda experience, and instructed the women on making their own kits to sustain this effort in the future.